Meredith Martin, assistant professor of educational psychology, is conducting research on factors contributing to peer threat to understand how children cope in different ways. Photo by Kyleigh Skaggs, CYFS. Take a moment to recall a particularly overwhelming day. Morning comes way too early after a restless, worry-fueled night of tossing and turning. A knotted, roiling stomach makes eating breakfast difficult. Deadlines loom, with too much to do in too little time. The computer isn’t working, reports or papers are due, and co-workers or professors are coming with demands from every direction. Nothing seems to be going well, and no one offers a kind word. And on top of it all, the car is making that strange noise again. Such days can send morale plummeting and stress levels skyrocketing, gradually chipping away at your overall well-being and making concentration nearly impossible. Now imagine enduring even worse stress, every day — at age 11. For youth experiencing bullying, exclusion and other forms of peer threat, anxiety can become acute. An ongoing University of Nebraska–Lincoln study is exploring ways to tailor solutions and enhance the lives of children dealing with emotional — and sometimes, physical — pain caused by classmates. Meredith Martin, assistant professor of educational psychology, is conducting research on factors contributing to peer threat to understand how children cope in different ways. “Feeling safe is a fundamental human need,” she said. “If children don’t feel safe, it’s much harder for them to learn other things, such as math, English or social skills. Peer threat has a wide range of symptoms, including aggression, yelling, insults, social exclusion and even violence. Martin notes statistics show that in a given school year, about 36 percent of youth report being bullied. “When you take into account all of the other experiences kids face in their peer relationships — conflicts, competition, exclusion — there is a likelihood a child is going to contend with peer threat,” she said. 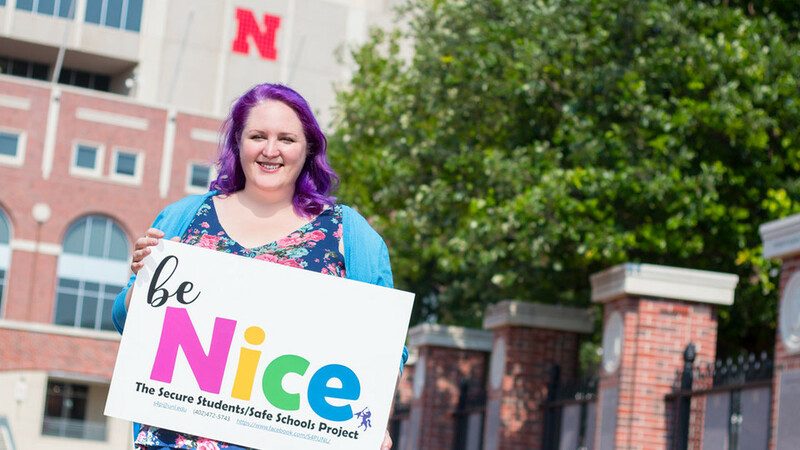 Her study, which is housed at the Nebraska Center for Research on Children, Youth, Families and Schools, is funded by a Layman Award from the University of Nebraska–Lincoln’s Office of Research and Economic Development. Martin is collecting data online from 150 youths, ages 10-16, from across the country. Data will be gathered through October and will also include information from one parent of each participating child. Data is collected through two assessments developed for the project: The Social Defense Inventory, a self-report questionnaire of youths’ affective and behavioral responses to peer threat; and the Go/No-Go Association Task, an implicit cognitive task that captures internal representations of the peer group. Once gathered, data will be analyzed through the end of 2018. “We’re looking for specifics on what motivates kids to respond the way they do to peer threats or bullying,” Martin said. One profile example, she said, is “mobilizing,” in which a child wants to engage in a conversation with peers but is afraid he or she will be picked on. Martin said children exhibiting such a response would be perfect candidates for a small group strategy, in which they would gradually gain skills and confidence they need to engage. For youths experiencing peer threat, Martin said, the energy required to maintain constant vigilance and readiness to defend oneself can elevate stress to damaging levels. Victimized youth lack social skills, tend to be more inhibited and often have impaired emotional development. As a result, she said, some children begin to perceive threats that don’t actually exist. For example, if a peer were to approach with good intentions, an insecure child may instinctively anticipate how that interaction might go wrong, and use social defense behaviors to avoid or defuse the situation. “They may have protected themselves from a possible threat, but they’ve also lost the opportunity to make a new friend,” Martin said. The ultimate goal of the study, she said, is to help develop measures to effectively identify youth adopting insecure profiles. “Feeling safe and secure is the foundation for learning and exploration, so it’s important we spend the time and resources needed to fix it,” Martin said.